With Cyclone Yasi - apparently the first recorded Level 5 Cyclone to hit the Queensland coast since 1918 - following so hard on the cataclysmic dump of rain on eastern Australia during January, people will be wondering: is it climate change? Both events are driven by exceptionally high surface sea temperatures - in the northern Indian Ocean the case of the January floods and in the Coral Sea in the case of Cyclone Yasi. How do these temperatures compare historically? Sea surface temperatures in the Australian region during 2010 were +0.54 °C above the 1961 to 1990 average. This is the warmest value on record for the Australian region. Individual high monthly sea surface temperature records were also set during 2010 in March, April, June, September, October, November and December. Along with favourable hemispheric circulation associated with the 2010 La Niña, very warm sea surface temperatures contributed to the record rainfall and very high humidity across eastern Australia during winter and spring. The most recent decade (2001−2010) was also the warmest decade on record for sea surface temperatures following the pattern observed over land. 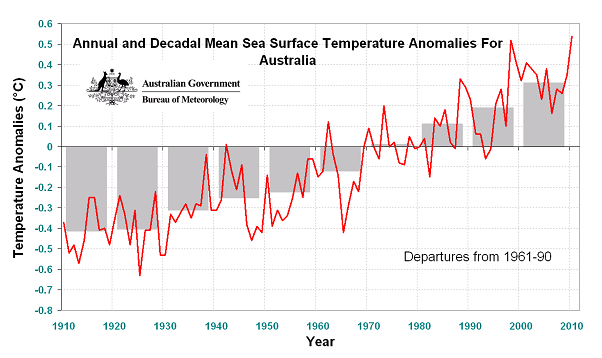 The following graph shows "Annual and decadal mean sea surface temperature anomalies in the Australian region (compared with 1961 to 1990 average)."